Tal, I speak for all of us when I say how special and important your organization’s work is. Keep up the great work, and we’re excited to have you back stateside very soon. So, enough about me!!! As I am now in the top of the 1st inning, of the next phase of my life, owning an indoor baseball facility, All-StarPerformance, and helping run a youth team baseball program, the St Louis Gamers, I am observing a plethora of youth baseball, and some things that catch my eye are alarming!! A_ _ with them. For High School pitchers, even the most accomplished of them, it is at best unnecessary, and worst a recipe for disaster. By allowing, or asking, catchers to sit on the corners to High School hitters, you are asking for a multitude of 1-0, 2-0 counts, extremely high pitch counts (more to come in a later blog! ), and infielders who are on their heels with excitement. If a pitcher has any movement at all, and the catcher is on the corner early in the count, there is a very good chance the movement will be lost, as it will end up off the plate, and result in ball ONE. Repeat this scenario on 1-0, and now you are in a definite hitters count. Sitting at 2-0, you are forced to throw a fastball, and groove it. It is a given, that throughout baseball, hitters averages go down between 50 and 100 points, the further they fall behind in the count. Conversely, the averages rise by these same point totals the further ahead they are in the count. Why not have your catcher set up on halves of the plate early in the count (0-0, 0-1,1-0, 1-1,), and teach your pitchers to pitch to contact. Let the natural movement they have work to the corners, instead of off the corner. You will keep your pitchers pitch counts down, keep your fielders on their toes, and in the game, and force the opposing team to get 3 hits to score a run, as opposed to having 2 walks, an error by a previously bored infielder, and a blooper that turns into a 3 run inning. If it is important on a fastball, then it becomes doubly important on a breaking ball. I do not see many High School hitters who handle a breaking ball very well. Not a hanging breaking ball, but a ball that changes directions and planes. So if the hitters are not going to hurt you with the pitch, why try to throw it to the corners and take a risk of falling behind. Get your catchers on the plate, and ask your pitchers to start the ball at the arm side ( pitchers throwing arm side) ear of the catcher, look to have the ball stay on the plate, and be received by your catcher near his opposite knee. 0-2 you ask??? Same thing!!!! Now you want your pitcher to start his breaking ball at the catchers (pitchers arm side) knee, and expect it to finish around the catchers opposite foot. You will have many more hitters offer at, and miss that pitch, than the ball that starts off the plate, and ends up in the batters box. A realistic approach to pitching at the highest levels ( College and Professional) is to get a hitter out, or on, in three pitches or less. That shouldn’t change at the lower levels of baseball. It should be encouraged, and tracked. Getting your catchers on the plate will give your pitching staff a shot at achieving this, while keeping down their pitch counts and keeping your position players in the game. Side Note: The same coaches who are asking their catchers to set up on the corners early in the count, are the coaches complaining that their pitcher is “nibbling” at the corners. Pick your Poison!!! Two missed free throws, ordinarily the cause of a coach’s headache, became the symbol of sportsmanship in a Milwaukee boys basketball game earlier this month. Milwaukee Madison senior Johntell Franklin, who lost his mother, Carlitha, to cancer on Saturday, Feb. 7, decided he wanted to play in that night’s game against DeKalb (Ill.) High School after previously indicating he would sit out. He arrived at the gym in the second quarter, but Franklin’s name was not in the scorebook because his coach, Aaron Womack Jr., didn’t expect him to be there. Rules dictated Womack would have to be assessed a technical, but he was prepared to put Franklin in the game anyway. DeKalb coach Dave Rohlman and his players knew of the situation, and told the referees they did not want the call. As a principal, school, school district staff, and community you should all feel immense pride for the remarkable job that the coaching staff is doing in not only coaching these young men, but teaching them how to be leaders. –Milwaukee Madison boys basketball coach Aaron Womack Jr. The referees had no choice. But Rohlman did. McNeal, a senior point guard, went to the line. The Milwaukee Madison players stayed by their bench, waiting for the free throws. Instead of seeing the ball go through the net, they saw the ball on the court, rolling over the end line. Womack, overwhelmed by DeKalb’s gesture, wrote a letter to the DeKalb Daily Chronicle, which had first reported the story. “As a principal, school, school district staff, and community you should all feel immense pride for the remarkable job that the coaching staff is doing in not only coaching these young men, but teaching them how to be leaders,” Womack wrote. DeKalb had traveled more than two hours for the game, and waited another two as Womack rushed from the hospital, where he had been with Franklin, to the school to gather his team. The two schools had met twice previously, and this one ended with a Madison victory, but as in the other games, they also a shared pizza dinner “four kids to a pizza, two Madison kids and two DeKalb kids,” Womack told the Journal Sentinel. So here I am, October 2006, 39 years young, a serious stress fracture in my forearm, 17 years of Professional Baseball, 8 organizations, and 4 foreign countries in the rear view mirror. I am looking at “What Now?”. Throughout these writings, I have had a constant theme. That being relationships, and opportunities that present themselves. Over the course of my playing career, I had envisioned myself at some point instructing, or coaching, at some level. Traveling the minor leagues on a bus again did not appeal to me. My Triple A manager in Syracuse had mentioned a guys name to me in St Louis that had an indoor baseball facility named Dave Pregon. After several discussions, we decided we liked each other enough to open a place together. Going into this process, I ran the idea by my business savvy buddy, and co-writer, Brendan Sullivan. Brendan gave me the name of a baseball enthusiast in St Louis, named Mark Gallion, who had coached area teams for quite some time. Mark had graduated from Harvard business school, and was open to sharing thoughts about what was needed in a facility in St Louis. In January of 2007 All-StarPerformance was opened. All-StarPerformance is an 18,000 square foot indoor facility where we now give numerous lessons throughout the year, as well as rent cages to teams and individuals. Over the course of the next year Mark, Dave myself, and another former Major Leaguer, Scott Cooper, who Mark knew from getting hitting instruction for his sons, started our team program, the St Louis Gamers. We have tried to model our program after some of the top programs nation wide, including the Headfirst Gamers in Washington DC, who are not coincidentally headed up by Brendan Sullivan. While both Gamer programs pride themselves on teaching the game of baseball at a high level, what separates both programs are the non baseball aspects that are instilled in our players. Both programs have instructors, coaches, and mentors that played the game at high level. These experiences give us instant credibility with the kids. Many programs have instructors with playing experience, but what we do with these opportunities is what separate’s us. Because of this credibility, we have an enormous opportunity, and obligation in our minds, to not only pass along baseball knowledge, but use teachable moments that only baseball can provide to impart life skills. Teaching how to have poise, for example, in challenging situations, because of not only your physical preparation, but your mental preparation is a rewarding experience that we coaches might not otherwise have the opportunity to enjoy. Watching a young athlete who is not used to failing deal with those emotions, and help him learn self control is satisfying as a coach. Helping, in small ways, to instill that character is what you are, and reputation is what others think of you, goes a long way in getting youngsters to take the high road, not necessarily the popular one. Seeing an athlete realize that he may not be the most talented kid on the team take the initiative, through hard work, develop his skill set to be a significant contributor to the team is energizing. So, while coaching at a Major University, or Major League organization, may be glamorous, what is truly rewarding is having the opportunity to affect young peoples lives in a significant way over the course of weeks, months, and seasons. As I look back over my career, I realize how fortunate I was to have so many good men as mentors and coaches. I am fortunate to be in the position to pass along wisdom pertaining to the game of baseball, but truly blessed to be in the position to help shape lives in the game of life. The 7th inning, as you well know, is a point in the game where fans stand and prepare for the stretch run. Players realize, for better or worse that this day’s battle is coming to an end. It is typically a time when short relievers begin their routine prior to a late inning appearance. As I reflect back, the 2004 season in Triple A Richmond, with the Atlanta Braves, was a little of all three for me. I was 37 years of age, returning from Japan and back in an organization that I had a history with. Often in Triple A, organizations sign veteran players to provide leadership, support and tutelage for their younger, upcoming prospects. When the season began we had very few veteran type players on our roster. The coaching staff gave me the closers role, and entrusted me with the bullpen and locker room chemistry. The season for me personally went great. The season for the team was hugely successful as well. We played in the International League Championship Series, losing in 4 games. The success of the team is what I enjoyed the most. Every year in baseball the make up of the roster is different. There are different personalities and egos to contend with. At the Triple A level another issue to contend with is players expectations. Young players are on the rise, knowing they are a phone call away from reaching their dream. Veteran players have often times tasted that success, and have a chip on the shoulder, feeling they are too good for this level. It can be an interesting mix for sure. One of several success stories from the 2004 season was a young, strapping Dominican pitcher named Roman Colon. Roman is a 6’4’, 225 lb right handed pitcher who throws 97 mph, but did not posses a second pitch. He was however, the owner of a quick temper, selfish attitude, and the ability to resist constructive criticism. Roman had risen through the lower levels of the minor leagues with little resistance from opposing hitters due to his sheer velocity. At the Triple A level that was not the case. Often times our short comings become apparent when we face adversity. Roman was no different. He was used to being “the man”. Now he was relegated to mop up innings to work on his second pitch out of the bullpen, and his ability to be a viable asset to the team. For whatever reason Roman sought me out numerous times during batting practice to ask me questions. He felt that the coaching staff didn’t like him, that his teammates hated him, and that the best thing that could happen was for him to go back to Double A. What I concluded from these talks was the Roman was as immature emotionally as he was developed physically. It was also apparent that his ego and confidence had been shaken. In baseball clubhouses a common, usually humorous, way of policing yourselves is Kangaroo Court. This is an animated court system where the players file fines against their teammates for injustices that range from being late for stretch, to pitchers leaving the dugout after being pulled out during the middle of an inning, to being on their cell phones in the clubhouse. At no time however is ones performance on the field mentioned. The court is usually made up of veteran players, with one of the leaders being anointed Judge. This particular way of keeping the clubhouse atmosphere light served two purposes for Roman. First, early in the process he had an in ability to laugh at himself, and took all good hearted ribbing personal. This led to some contentious moments for sure. Second, the Kangaroo Court system forced Roman to be accountable to his teammates in regards to team rules, and conduct. After about two months Roman made a transformation. He had, through diligent work, developed a nasty slider, and either through a conscious effort, or the Courts persistent nature, became a reliable member in the clubhouse. I never had the opportunity to ask which it was. Roman was called up to the Atlanta Braves big league team not long after he learned to be, in one word, a Teammate. His ability had never been a question with the organization, however his ability to fit in had. Having learned this tough lesson, Roman was able to reach the pinnacle. Two days ago, I found myself driving with two of my South African colleagues through the winding streets of Umlazi Township in Durban. The mood in the car was solemn. We had recently learned that another colleague of ours, Shabba, had died unexpectedly on Christmas Day from complications due to HIV/AIDS. Though he had contracted tuberculosis (an opportunistic infection commonly associated with HIV) a few months earlier and had been weakened significantly, we all thought he was on the path to recovery and maintenance after starting a new treatment plan. The news caught us by surprise and also served as a stark reminder of the powerful and abnormally deadly combination of HIV and poverty. While driving through Umlazi, on the way to Shabba’s father’s house to help deal with funeral arrangements, the three of us talked about Shabba – his fiery personality and sense of humor, as well as his love for the game of basketball. Unlike many South Africans, even those who enjoy hoops, Shabba was a true student of the game. He was a FIBA-certified referee and a stickler for fundamentals. As a coach, his emphasis on the fundamentals combined with his passion for the game shaped and inspired many township youth to use basketball as a vehicle toward a positive life. It was not an uncommon site to see Shabba leading a group of children in a post-game ritual of jogging around the court and singing at the top of their lungs. Shabba proved to them that joy and learning could go hand in hand. Nothing will make the fact that Shabba is no longer with us any easier. His death at the age of 28 was premature to say the least; he will be missed greatly. But the words of Shabba’s father shed an important light on the importance of what he accomplished in his short life. He found a way to better the lives of hundreds of youth – to give them hope for their future. He let them know that he had made mistakes and that they should learn from those as much as they learned from his basketball tutelage. Shabba did what he could to make the world better than the one he inherited. He didn’t get as far as he or any of us would have hoped, but his body of work will live on in the strength of those that he impacted – on the court and off. It was toward the middle of the 2002 season, I was in Triple A, Colorado Springs, with the Rockies organization when I was approached by a team from Japan. The Yokahama Baystars wanted me to go to Japan and pitch for them in the 2003 season. Some look at leaving the country as ending your career in the states. I looked at it as an opportunity of a lifetime. I packed my bags on January 29th of 2003 and 17 hours later I found myself landing in the Tokyo airport ready for the adventure. There are many different topics I could choose to discuss from my experience over seas. However, what I found most enlightening was the purity of the country, the respectful nature of the people, and the unrelenting, disciplined work ethic of the people there. I had always prided myself on the conditioning aspect of being a professional athlete. When I made the decision to play in Japan, I reached out to people I knew who had traveled that road. The one consistent message I heard was that the conditioning was nuts over there. I put in more time that offseason training than ever before, but when Spring Training began the first week of February, I learned first hand what the Japanese think of as conditioning. By the end of the “active warm up”, a 45 minute “ warm up”, we had accomplished what most Major League teams do for post practice conditioning.. One of the Japanese league favorites is to have their pitchers jog with a car tire attached to a rope, that is placed around your waist, and pull it along the out skirts of the sand infields. You can imagine how heavy those were as they began to fill with sand. Then consider this was taking place after being on the field for 7 hours already. Good times. Needless to say, I would end up in bed at the end of each day with ice packs on both shins, my right shoulder and elbow. Off the field, the work ethic is evident in that there is no tipping. Cab drivers, waitresses, and door men do their required service without allowing you to tip them. Imagine that, doing a job to the best of your ability because you have pride in yourself, not because you think you will get extra compensation. It was an experience for sure. As eye opening as the conditioning, was the respectful nature of the people. The Japanese consider it an honor and a privilege to be able to play the game of baseball. They demonstrate this in many ways. In the dugouts there is no spitting of seeds or tobacco on the floor or ground. They use a cup and dispose of it. When leaving the field of play the players stop, turn to the field, remove their cap and bow. It is a way of saying thanks for letting us participate. With age comes respect in Japan. Being 36 at the time, I was considered a veteran ( senpai), even though I had never played in Japan. This stature gave you special treatment from the trainers, translators, coaches and players. You were placed first in line for dinner, at the training table for ice, and when boarding a plane, or train, when with the team. In their business world that is how you climbed the corporate ladder, by age. When an “older” business man, within your company, asks you to go to dinner, it is considered a privilege, but also mandatory, regardless of what ever else is going on around you. In other words if your sons birthday falls on the same day that a senior business man requests your presence at dinner, the dinner takes precedent. As much as I was impressed with areas of the Japanese culture, I think I was most taken back by the fact that their culture is unique to them. In the US, we are a sort of melting pot of cultures. In Japan so many aspects of their culture is unique to them. When entering a home from the outside world, the Japanese remove their shoes. They do not want to bring any uncleanliness into the home, which is considered sacred, similar to the dugout. The cuisine in Japan is unique to say the least. First, nothing is wasted. Everything you see grown above the ground is suitable to be consumed, as well as the root system holding it in the ground. When an animal is killed, there are no wasted parts here either. I tried to take in the whole experience of being in Japan. I can say that I tried parts of a cow, ( tongue, throat, rib cartilage, ear, to name a few) that I had no idea could be used for dietary purposes. When I left Japan, and returned to the states, I had a new sense of appreciation for people and the cultures that they come from. I am fortunate and grateful for the opportunity they afforded me to play, and live in Japan. It is another example of how relationships and experiences you encounter shape your future. My pitching line from Japan lacked something to be desired, but my line on life lessons and traits of successful people took a turn for the better. I just returned to Los Angeles late Monday night from my 5th trip to the Dominican Republic and thought I’d share a little story. Quick background: the reason for the yearly trips to the DR that many coaches on this blog have participated in is John “Coach Mac” McCarthy’s Beisbol y Libros program. Located in Consuelo, a small town about 30 minutes outside of San Pedro de Marcoris, the ByL program has been running in one form or another since 1999 as a way to use baseball as motivation for students to get after it in the classroom. Needless to say, most families in Consuelo are extremely poor and in addition to lacking basic needs such as three meals a day and health care, the baseball-crazy kids there are without gloves, balls, bats, and helmets; they play baseball in the street with sticks as bats, rocks as balls, and milk cartons as gloves. Coach Mac’s program provides any child in Consuelo the opportunity to participate in daily practices on well-maintained fields with equipment and trained coaches, as long as they keep up with their studies in the classroom. Every week during lunch at our Spring Training Summer Baseball Camp, Coach Flikke or I tell the story of the Dominican little leaguers and how different their lives are from those of our campers. 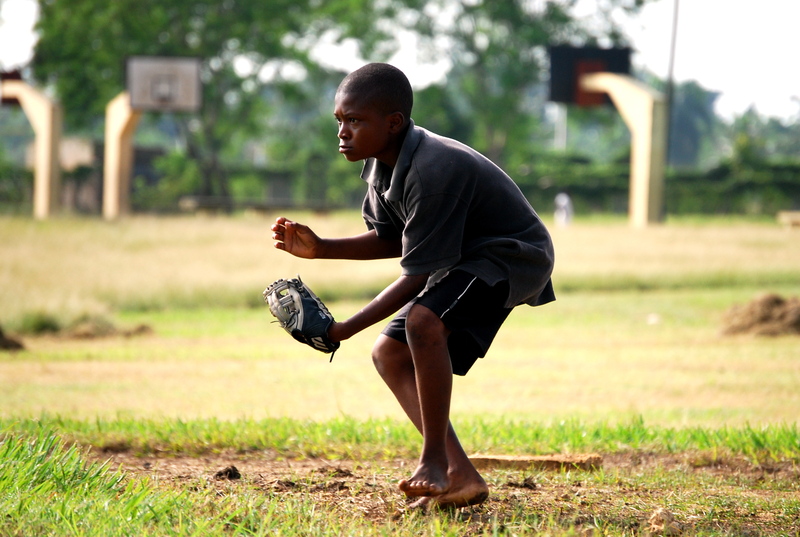 We talk about how little money they have, how many of the kids in Consuelo go to bed hungry every night, and how all any of them really want is a baseball glove to call their own – something I certainly took for granted growing up and I’m sure many of our campers do as well. We also relay to our campers how much we admire the Dominican’s love for the game and how it is reflected in the joy they exude whenever they are on the diamond, despite the difficulties they face in their daily lives. The point of telling the story is not to make our campers feel guilty for the luxuries they have, but rather to make them feel thankful for the little things that are often taken for granted. We wrap up the story by encouraging the boys and girls to bring in any of their old baseball equipment to donate to the kids in Consuelo, and every week I drive away from the field with dozens of gloves, hats, batting gloves, balls, and cleats to bring with me on my trips to the D.R. I’m extremely proud of how generous all our campers have been with their equipment over the years; but one story of selflessness last summer really stands out. Graham, one of our long-time campers, was planning his 12th birthday party and decided that he wanted to do something special for the kids in Consuelo. So, in lieu of asking for presents for himself, he asked all his friends to bring a brand new glove to his party so that he could then, in turn, give the gloves to the ByL program. When all was said and done, the program in the Dominican had 25 new gloves to use at its practices. Graham decided that the joy the Dominicans would get out of receiving new baseball gloves would far outweigh the joy he would get from another year of presents for himself, and he acted upon that notion. The simple act of putting other’s needs ahead of your own is an impressive thing to see; to witness that level of self-awareness and selflessness from a 12 year was just awesome. We often talk about the virtues of being a “giver” and not a “taker.” Graham exemplified what being a giver is all about. As coaches, winning games is fun and watching our players succeed on the field both as individuals and as a team is definitely rewarding. But stories like Graham’s…that’s really why we coach. Ahead in the Count is written by Ted Sullivan, Brendan Sullivan, Matt Whiteside, John Bramlette, Dan Spring and Tal Alter. Our experiences as players and coaches have taught us that the athletic field can be a platform for learning some of life’s greatest lessons. This is why we coach. We’ve been lucky enough to deliver these lessons to thousands of young athletes and we hope that an open discussion of these experiences with parents and fellow coaches might be an effective way of impacting the lives of even more. The first post of this blog introduces the contributors and gives a little background of why we’re writing. We’re working on some pictures too. Feel free to add your own take in the comments section of any post.